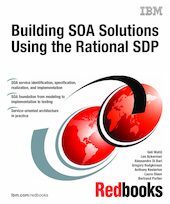 This IBM Redbooks publication explains the concepts and practice of developing service-oriented architecture (SOA)-based solutions using the IBM Rational Software Delivery Platform (SDP). It uses the latest version of IBM Rational Unified Process (RUP) that includes service-oriented modeling and architecture (SOMA) content from IBM Global Business Services. This book aims to help practitioners that are working on SOA-based projects. Practitioners can learn the core concepts behind SOA as well as how to use the tooling to automate the tasks involved in developing SOA-based solutions. The main thread of this book takes business requirements, business architecture, and existing assets as input, and derives the elements of a service-oriented architecture that are needed to realize the business requirements. The book covers architecture in detail, and shows how the architecture is realized through service identification, specification, realization, implementation, and testing. The book is organized around a practical example case study and provides tool and process guidance as well as additional references around key topics.